“I recently replaced my old iPhone with Samsung Galaxy S8+. Do you know any easy way to transfer my text messages from iPhone to the new Android phone?” Said by John Narro. Have you met the same problem as John? Don’t worry about it as you’ve already arrived to the right place for getting best solutions. Hereof, we will share 2 different ways about how to transfer SMS/iMessages from iPhone to Android phone. Part 1. How to Transfer Messages from iPhone to Android Manually? Part 2. How to Transfer iPhone Text Messages to Android in a Click? This method will take a few minutes that you need to perform the below actions manually. Connect iPhone to your computer, open iTunes. Right click on your iPhone and backup your iPhone data to computer. For Windows computer, the backup file is stored under this path as default: C://[Users]/[Username]/AppData/Roaming/Apple Computer/Mobile Sync. For Mac computer, the backup file is saved here as default: /Users/[Username]/Library/Application Support/MobileSync/Backup. Please navigate to the latest file: 3d0d7e5fb2ce288813306e4d4636395e047a3d28. Or you can search the file name to find it more quickly. Copy and paste the most recent backup file to your Android phone. Download iSMS2droid from Google Play store and install it on your Android phone. Start iSMS2droid on Android, tap “Select iPhone SMS Database”, choose the file “3d0d7e5fb2ce288813306e4d4636395e047a3d28”, click “All” to load all the text messages. Then the iSMS2droid will automatically start converting iPhone SMS to Android-friendly SMS format (XML file). Then you have to download and install another App on Android in order to restore the converted text messages to Android. Download and install Android app “SMS Backup & Restore” from Google Play store, then install it on your Android phone. Run the app on Android, tap “Restore” and choose the XML file converted by iSMS2droid. Choose to restore all text messages. When it has finished, all the iPhone text messages should have been successfully transferred to Android device. Part 2. How to Transfer Text Messages from iPhone to Android in a Click? Supported iPhone Models: iPhone 7, iPhone 7 Plus, iPhone SE, iPhone 6S, iPhone 6S Plus, iPhone 6, iPhone 6 Plus, iPhone 5S, iPhone 5C, iPhone 5, iPhone 4S, iPhone 4, iPhone 3GS. Supported Android phones: Samsung Galalxy, HTC, LG, Sony, Motorola, Google, Huawei, ZTE, Xiaomi, OnePlus and all other Android devices. Gihosoft provides Phone Data Transfer software for Windows and Mac users. Once you have downloaded it, please install the program by following the setup instructions. If you have trouble in connecting Android device to computer, please check the linked guide to fix it. Once the phone names have been showed on software interface, please go ahead to the next step. 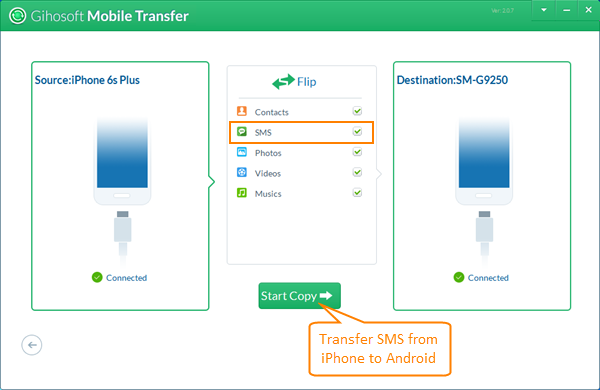 Now please mark “SMS” and click “Start Copy” to start transferring iPhone SMS to your Android smartphone. Note: Apart from transferring messages from iPhone to Android, Gihosoft Mobile Transfer also allows you to transfer contacts from iPhone to Android, as well as media files like photos, videos, music, etc.